This is an advertisement for Davidson and Company, manufacturers of lawn tennis equipment. Lawn tennis was a popular sport during the early part of the 19th century, initially a ball was hit back and forth, without keeping score. The game was thought to require no particular skills or technique and little strength, and was therefore ideal for women. Soon players became more competitive and by the 1880s it was ‘all the rage’ for men and women to play tennis. In July 1877 the All England Croquet and Tennis Club held the first Lawn Tennis Championships, however The Lawn Tennis Association was not set up until the 26th of January 1888. 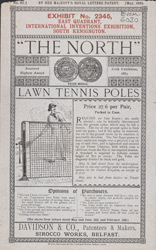 By this time the court shape and size had been determined, as had the height of the net, which is why the posts advertised in this leaflet, were so important.